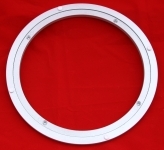 This new bearing is made from aluminium with a 400mm outside diameter with a 12mm thickness. A load rating for the bearing is 300kg. A 2mm offset between the inner and outer ring allows the bearing to spin freely alleviating rubbing. The 5mm counter sunk holes come with removable non-skid stoppers giving you the choice of producing a Lazy Susan in the traditional way or just fixing the bearing to the underside of your timber, saving material and labour costs.